What happens if you don’t brush your teeth? Cavemen didn’t and animals don’t brush so why do I need to? If you don’t brush your teeth for one day or night, whilst it’s not ideal, nothing much is likely to happen. In the short term, if you continue to not brush your teeth, you will encounter problems such as plaque build up, tartar build up, and bad breath. Longer term more serious problems such as tooth decay, tooth loss and gum disease will occur if you do not regularly brush your teeth. We discuss these problems and other issues in more detail below. If you’re unsure about the best way to take care of your teeth, see our guide on teeth brushing. Brushing your teeth should be an essential part of your daily routine, no matter your age or circumstances. Both the National Health Service (NHS) in the UK and the American Dental Association (ADA) recommend brushing your twice a day for 2 minutes. What actually happens if you do not brush your teeth will very much depend on how long you choose not to brush your teeth for, your diet and general health. Your teeth are not likely to just fall out if you fail to brush once or twice, but continuing to do so will cause a chain of health issues that will likely lead to eventual tooth loss. If you simply forget to brush one day is one thing, actively choosing not to brush is another. Let’s be honest, most of us have probably at some point gone without brushing our teeth once in a day, be that intentionally or not. There are probably a fare few of us who have not brushed for even longer, be that 24 or 48 hours. Heck, I have when I was testing out plaque disclosing tablets. However, this is by no means advisable and you really should follow the advice of dental professionals and governing bodies like the NHS and ADA. As Downtown Dental Clinic put it, ‘the buildup of plaque that causes gum disease can occur within a 24 hour period’. If you have gone without brushing your teeth you probably know how bad it feels when you don’t. I know from purposely not brushing, that my teeth have felt sticky and sort of furry to the touch, my breath smelt and tasted bad and I just felt a bit more conscious. In fact, the bacteria that are in your mouth start re-attaching to the teeth in what is called a biofilm, within mere hours. The biolfilm contains bacteria, and food leftovers from whatever you put into your mouth. As the bacteria continue to grow, this biofilm will also contain acids and other waste products. Biolfilm grows over a few hours and as it develops you may feel it as that white furry stuff on your teeth – this is plaque! The photo of my teeth above was just after 24 hours and the results of my plaque disclosing tests clearly showed the importance of brushing. The Harvard Gazette has written how the human mouth is home to over 600 types of bacteria. Some of these are good, protecting our mouths, but many are able to do real damage. Some types of bacteria specifically cause tooth decay, such as Streptococcus mutans, whilst some bacteria are linked to gum disease. Many of these bacteria come together to form what is known as plaque. The Gazette describes plaque as a coating of bacterial film that feeds on the residual sugars left in your mouth. It produces acids that eat away tooth enamel and cause cavities, or small holes, to form. Those lingering sugars are like a banquet to plaque bacteria. It is not possible to conclusively say what will happen to you as an individual if you do not brush your teeth, because there are so many variables. For example, someone who does not brush their teeth but drinks only water, eats very healthily and exercises is likely to fare better than someone who eats a lot of sugary foods, drinks sugar rich drinks, and partakes in no exercise. However, genetics, personal health and general dental health all play a part too. Plaque is one the of the main reasons we brush our teeth and is in part the cause of many of the other negative effects of failing to brush. 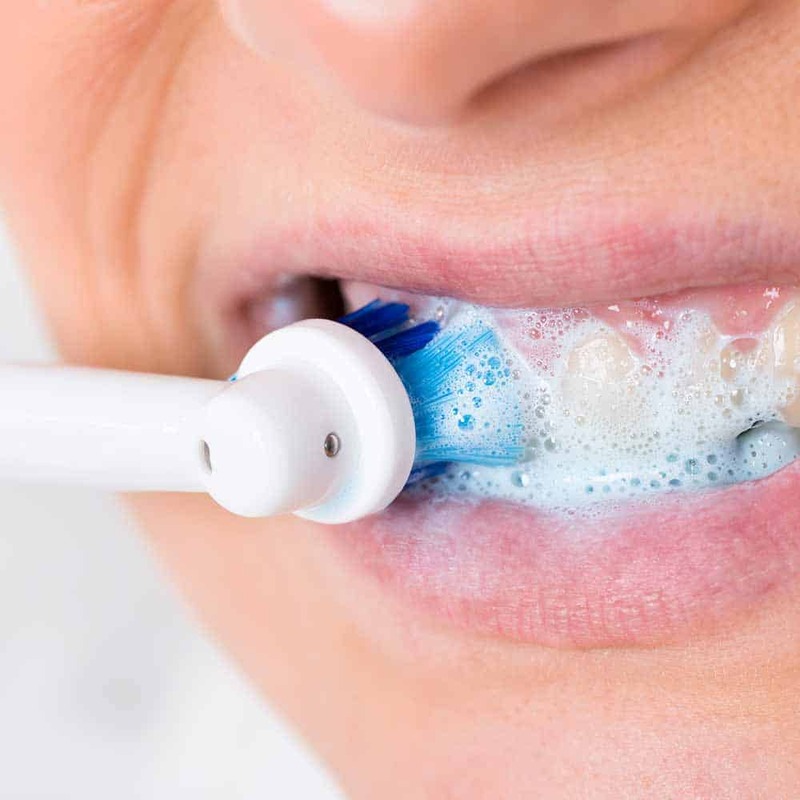 Developing in less than 24 hours, if not cleaned away by toothbrushing, the bacteria feeds on the sugars in the mouth and grows. Over time the plaque will get thicker and heavier, If plaque is not removed with toothbrushing, the minerals in your saliva will harden the soft, sticky substance into tartar (also known as calculus). Plaque forms all over your teeth. It forms on the flat surfaces of your teeth, where your tongue may remove some of it. More worryingly, as the plaque forms, it also does so in places like the gingival crevice. The gingival crevice is the small space between the tooth and the gum. The bacteria in plaque produce their own waste products, such as acids. These waste products can irritate the gum, causing them to swell, become red, sensitive and bleed. This is the early stages of gum disease- ginigival inflammation, or gingivitis. Tarter is a hard deposit that forms on the teeth, and it does so as the result of failing to effectively remove plaque. Tartar may also be called calculus. Your saliva naturally contains minerals and ions, and it is these which cause the soft sticky plaque to harden into tartar. It takes some time for this to form, but when it does it is very resistant to removal. Only professional cleaning by a dentist or hygienist will get rid of this build up. In itself, tartar or calculus is not a problem. However it is a massive indicator to your dental professional that you are failing to clean effectively. Tartar is also more sticky than your tooth surface, so you are more likely to have more gum-irritating bacteria stick to the tartar than your tooth. Tartar will pick up stains more quickly than your teeth. This is especially true if you drink lots of tea or coffee, or if you smoke. If you notice dark stains building up around the edges of your teeth, consider a professional clean to remove the stains and then improving your techniques at home to prevent them building up in future. Over time, if the teeth and gums are not properly cleaned, the plaque is not removed. The plaque builds up and the bacteria in it produce acids which irritates your gums. This irritation in your gums will show as redness with bleeding, swelling and tenderness. It can take just a few days for these symptoms to develop. This is the early stages of a condition called gingivitis, or as it might more commonly known, gum disease. Living with such can be uncomfortable and affect your mood and general health because you feel down about, or embarassed by, the condition of your mouth. In order to treat gingivitis (early gum disease) and to stop gums bleeding, you need to remove the plaque and bacteria that are irritating the gums. This is easily done by improving your cleaning at home. By simply improving your cleaning at home, you should see visible improvement within a matter of days, and within a couple of weeks the bleeding should stop altogether. If left untreated, gingivitis may develop into periodontitis, which is when the bone that holds the teeth in is also lost. Not everybody who develops gingivitis will progress to periodontitis, and there is not a lot of evidence as to why this may or may happen. Genetics plays a big role in protecting you. However diseases such as diabetes, or if you are a smoker, make it more likely that this will hapen. Periodontitis will never improve unless you improve your cleaning at home. The bone loss that occurs with periodontitis is irreversible. Eventually the teeth will become loose and fall out. With all the nasty bacteria not being brushed away and feeding on the sugars in the mouth your breath will likely take and a unpleasant smell and taste. The bacteria that are in your mouth release waste products like sulphites that contribute to bad breath. Failing to brush your tongue can mean that more dead cells are stuck there which can also attract more bacteria! Brushing cleans away the bacteria before it can make your breath smell and taste bad. This is more of a psychological effect of failing to brush rather than a physical one. If you end up with bad breath, gum disease and decay of the teeth as a result of not brushing, you are likely to feel sorry for yourself and have less confidence when out and about, be that in public or around family and friends. You will be more conscious of your mouth and become quieter and more reserved, smile less and generally feel worse and less confident about who you are and what you are doing. As the plaque builds up the bacteria in it continues to release acids. These acids do harm to your teeth as they dissolve the outermost surface of the enamel, removing the calcium that forms the hard mineral structure of the enamel. This process is called decalcification, or demineralisation. Removal of minerals occurs initially on a microscopic level. In actual fact, if you change your habits and look after your teeth better you will be able to reverse these very first stages of tooth decay. Unfortunately if nothing changes and plaque continues to build up, and if the bacteria continue to be fed by the sugars that your put into your mouth, the perfectly formed tooth begins to look nothing like it did before. Teeth with decay will start as white spots on your teeth, which may pick up stains or develop further to become black spots. Worse than this, holes will develop and teeth, often become infected and very sensitive as the more more receptive and less protected inner layers of the tooth are exposed. Actual tooth loss will likely be one of the later results of failing to brush the teeth. If you have managed to get through the pain and other health implications of not brushing, not to mention the confidence issues of having poorly maintained teeth, then teeth may begin to come loose or fall out or have to be removed by a dentist. Teeth become loose as the gum disease caused by bacteria in your gums cause bone loss around the teeth. Teeth with large holes and infection in the central nerve of the tooth require root fillings or extractions. Root canal therapy (root fillings) may not even be an option if the hole has been left for such a long time that there is only a small amount of tooth left. By this point you are likely going to have no option but to seek professional assistance as the pain, discomfort and possible infection might just be too much. Failing to look after the teeth in your mouth will mean that the bacteria inside is can continue to form and worsen. The imbalance in bacteria can lead to higher levels of nasty bacteria in the body. This travels through the body, potentially causing damage to your immune system, the body’s natural defence to health issues. Pre-existing conditions like diabetes will only get worse with poor oral health care (American Diabetes Association). In fact, there is a lot of evidence showing the link between poor oral health and poor control of blood sugar levels. As well as the well reported links with poor oral health and diabetes, there are also links between failing to clean your teeth and damage to your heart. Research has shown a possible link between oral health and heart disease. The bacteria that develops as plaque on your teeth can transition and develop on the arteries that feed vital organs like the heart and eventually case heart disease. Although there is yet to be conclusive evidence, “the mouth can be a good warning signpost,” says Ann Bolger, M.D., William Watt Kerr Professor of Clinical Medicine at the University of California, San Francisco. “People with periodontitis often have risk factors that not only put their mouth at risk, but their heart and blood vessels, too. But whether one causes the other has not actually been shown.”Links between oral health and other medical conditions are more difficult to prove. The National Institute of Arthritis and Musculoskeletal and Skin Diseases (NIAMS) have also supported research that suggests the use of dental x-rays can be used as a screening for conditions like osteoporosis. It’s fair to say that if you don’t brush your teeth you are unlikely to go and visit the dentist, where x-rays form part of routine examinations and could potentially pick up on these other life changing conditions. Whilst questions remain over the links, do you want to take the risk? A systematic review of previous studies believe that there is a link between chewing and blood flow to the brain. This blood flow impacts the brain’s ability to act and function to its fullest. Those with 20 teeth or less are 26% more likely to develop cognitive issues that could lead to Alzheimer’s. It is quite common for those with poor dental health, or those questioning the need for brushing to refer to prehistoric man and animals. Whilst the evolution of the toothbrush has really only excelled within the last 100 years, brushing utensils date back to 3500 BC. More recently a team at Spain’s Institut Català de Paleoecologia Humana i Evolució Social (IPHES), found at the Cova Foradà site in Valencia, Spain, a fossil of a human skull complete with teeth which researchers estimate at 50,000 to 150,000 years old. Having assessed the teeth found embedded in the upper jaw of an ancient skull fossil, they showed signs that toothpicks were used, even then. Whilst the modern toothbrush might not have been used as we know it, it is interesting to see that tools were used. However, there is another big factor that plays a part in why humans need to brush their teeth in comparison to animals and even our ancestors. That reason is our diet. Many of the foods we humans eat are rich in sugars, which bacteria love. When you don’t brush your teeth, these bacteria feeds on the sugars. We discussed before about how the bacteria produce acids as a waste product of eating the sugars. It is these acids which cause the softening (demineralisation or decalcification) of the enamel. Without sugars the bacteria do not produce enough acids to damage the teeth. Just as important as the total amount of sugar we feed the bacteria is also how often we put the sugars in our mouths. Sipping on sugar, fizzy drinks is a modern habit causing chaos with our teeth. 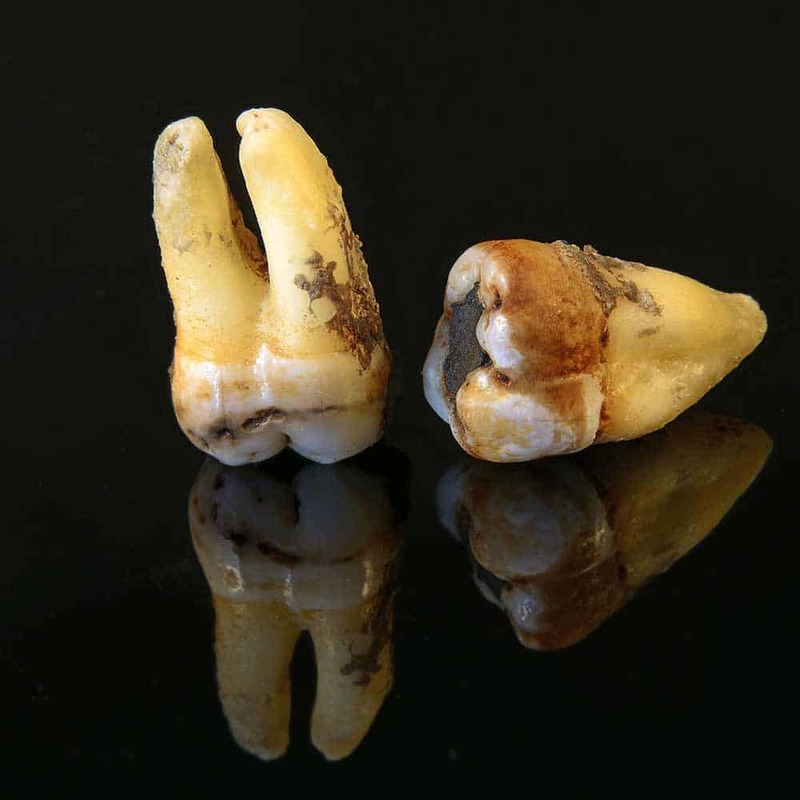 Prehistoric man had a more savoury diet that not only caused less damage by causing less decalcification, but which also acted to clean the teeth as it was more abrasive. Animals and prehistoric man also do not graze on sugars as modern humans do! If you really want to see a real life example of what happens if you do not brush your teeth, then the following video perhaps gives the best modern day example of the consequences. 21 year old James admits to having taken no real care of his teeth over the years and eaten all the wrong things. As his teeth became worse, the more frightened he became of the dentist and thus took no action to rectify the problem sooner. Dr James Russell who oversaw the reconstruction of James’s smile highlights that his gums were in relatively good shape and there was not all that much sign of gum disease, but there was severe decay. The teeth were caked in lots of plaque and tartar that had built up over the years. After a thorough cleaning, CT scan and examination it was determined that James was actually suitable for dental implants. 11 teeth had to come out, and make way for the implants. These are an effective, but very expensive dental procedure that was able to give him back his smile and confidence. The words of South East Family Dental I believe sum up the question of ‘what happens if you don’t brush your teeth?’ best..
It’s just a fact of life, and while good oral hygiene can help abate the build-up of bacteria, the presence of these little critters is normal, and part of every healthy mouth. The problem, however, is that bacteria eat the food particles left on our teeth, and release substances that corrode enamel over time, leading to tooth decay. If you want to enjoy tooth decay and the associated problems that go with such, you are most welcome. You will be opting to go against advice from leading organisations and putting your overall health at risk. How long & how often should you brush your teeth? Should you brush your teeth before or after breakfast?